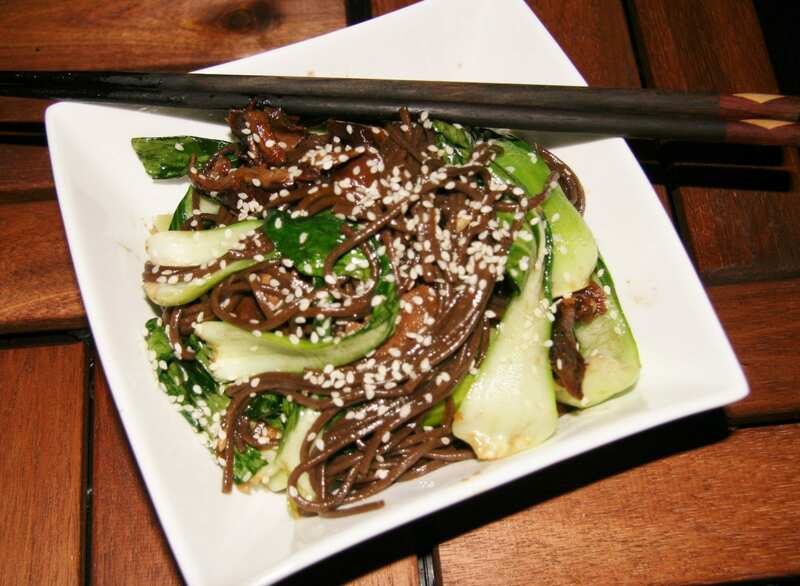 Shiitake Bok Choy Soba Noodles - Wholly Delish! I’m always on the lookout for new recipes – especially vegetarian recipes as we continue in our efforts to eat less meat. This Shiitake Bok Choy Soba Noodles bowl was a great find! For a long time I had a look list of bookmarked food blogs, subscribed to recipe newsletters and devoured foodie magazines. Then I found Flipboard and, more recently, Pinterest. I end up pinning so many ideas that I know. I’ll never find the time to try them all. But every week when making my shopping list, I flip through and choose one and I give it a go. I found this Shiitake Bok Choy soba Noodle recipe on Pinterest from the A House in the Hills blog – the original recipe can be found here. The contrast between the rich poking shiitakes, bright green greens and dark noodles really stood out in my feed! I have modified the recipe to use regular butter, soy sauce instead of tamari (I have limited storage in my condo kitchen, so I don’t keep both on hand), a bit less ginger (simply a preference) and a bit less soy to reduce the saltiness. I tried it for the first time that very week. My husband and I both loved it and it became a weekly staple for a while. Then, as often happens, I tried some other new recipes, defaulted to some old favourites and it fell off the radar. I made it again this week and remembered just how tasty it is. I’m posting it here partly because everyone should try it and partly so I don’t forget about it again! The salty sesame flavours really pack a punch and the mushrooms and soba noodles make the dish somehow light and healthy and yet hearty and filling at the same time. Absolutely delicious! Prep the mushrooms and Bok Choy, ensuring both are well cleaned of grit. Cook soba noodles according to package directions. Rinse immediately under cold water. Meanwhile, add the butter, 1 TBSP of soy sauce and the shiitakes to a wok or large frying pan and cook over high heat for five minutes. Stir to coat the mushrooms and then leave them alone to caramalize (they should be well browned on one side and slightly sticky). While the mushrooms are caramalizing, mix the sesame oil, mirin, garlic, ginger and remaining soy sauce in a small bowl. Reduce the heat at to medium. Add the sauce and Bok Choy and sauté until Bok Choy is cooked through but still retains some crispiness. Add the noodles, toss to coat and then sprinkle with sesame seeds. Serve warm. One Response to "Shiitake Bok Choy Soba Noodles"